Ninazu is a Sumerian god and His name means Lord Healer. Ninazu appears in cuneiform literature under several, sometimes quite contradictory aspects, and His might be very well the case of different traditions being fused around a single divine name in the course of time. Ninazu is known since the Old Sumerian period as the city god of Eshnunna, residing in the temple E-sikil. In a hymn to this temple, He is described as a warrior, a champion who destroys the cities of the rebellious lands, as well as the son of Enlil and Ninlil. Indeed, in this myth, Ninazu is the second god conceived during Ninlil´s descent to the Underworld, when Enlil meets Ninlil disguised as the Gatekeeper of the Devouring River. Perhaps because He was conceived by the banks of the waters that can devour one´s being and soul, Ninazu became the Guardian of the Waters of Life, whose source was thought to be found in the Underworld. Ninazu is also called 'the Lord who stretches the measuring line over the fields', and the epithet is related to the establishment of field boundaries after flooding. My interpretation of this epithet relates to the life of the land, which is brought about by natural irrigation, or the flooding of fields which will be then ready to receive the labors of wo/men. This makes Ninazu also an agrarian deity, and this function is described in a myth called Ninazu and Ninmadu, or The Creation of Grain. In the beginning, so the story tells, people ate grass like sheep, they knew neither grain nor beans. Anu, the Skyfather, and Enlil, Lord Air/Wind, appear on earth, the primordial countryside, and then Enlil bars the entrance of Kur and his followers to the living earth. Ninazu then suggests to his borther Ninmada that they fetch the grain to Sumer and they appeal to the Sun God Utu for help. The composition ends here, but the success of the enterprise is ensured, with the usual pattern of Sumerian texts. In the period of the Third Dynasty of Ur, Ninazu was connected with Nanna, the Moon Lord and patron of Ur, as well as with Enki. In the post Ur III period, Ninazu seems to have been worshipped primarily as a healing deity: He was involved in purification rituals and is the father of Ningishzida. In the early twentieth century A. J. Frothingham presented to the Philological Association and the Archaeological Institute that the real character of Hermes and his kerykeion could be traced back to early Mesopotamia. He believed that the Babylonian Caduceus evolved to the Greek Caduceus. A libation vase which is stored on exhibit in the Louvre was excavated from the ancient Mesopotamian city of Lagash. The inscription on the vase reads: "To the god Ningizzida, his god Gudea, patesi of Lagash, for the prolongation of his life, has dedicated this" (see picture in the beginning of this text). Also on the vase is a figure of two entwined snakes on a rod. The vase has been dated as early as 4000 to 3000 B.C. There are other images cast into the vase that can correlate an association with the caduceus. Ningizzida was the predecessor of the Egyptian god Thoth. Ninazu, who was called the "Lord of Healing" was the father of Ningizzida. It was also represented in other examples of artifacts and emblems from that era. Among the Hittites, a third century Roman coin, a caduceus-god like mysterious symbol is shown between two seated gods. These were possibly the gods of Hierapolis of Syria. It was also stated by Professor Frothingham that the caduceus of the Hitties and the Babylonians was brought to the Etruscans of primitive Rome. Aesculpius' daughter or wife Hygeia, the Greek demigoddess of health, is usually depicted with a serpent entwined and sometimes with an Aesculpius Staff. It is said that Ningizzida is related to the Greek Hermes. 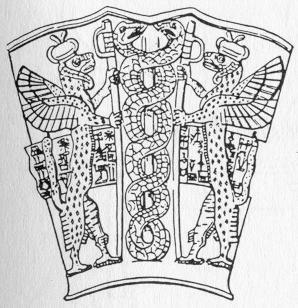 Also, early illustrations identified with Ishtar, show Her with a caduceus. More evaluation needs to be done and it will sometimes be left to the author or the audience to decide. The earliest caducei were an 8 shaped figure with the top circle opened. Snakes were added as early as the fifth century B.C. but remained unusual until the Middle Ages or the early Renaissance period. The wings were added in the fourth century B.C. Snakes are considered to represent eternal life as they shed their skin and thus renew their strength and youth every year.